CSI has the ability to locate and report live or dead services in and under concrete structures. Active mode: Where possible CSI induces its own signal into electrical conduits, data or copper gas pipes by using digital underground service locating equipment. Passive mode: By sweeping the immediate and surrounding areas for services, we can find the problem even before starting up the GPR equipment. Sometimes conduits are tied directly to reinforcing and this makes detection by GPR almost impossible. 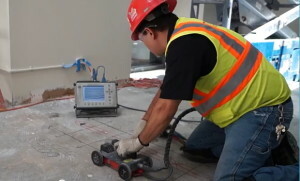 By combining the two (2) techniques of service locating and Ground Penetrating Radar, we significantly increase our chances of finding the services before any cutting, coring or drilling has done damage that will cost you money, downtime and even in some catastrophic circumstances, lives. You May Need About Our Services.